Today is Constitution Day. Please take the time to reflect upon the principles that inspired our independence from Great Britain, united independent sovereign states, and inspired generations of Americans to put themselves in harm’s way to promote the same to those who have been and continue to be oppressed all over the world. The most important of these principles is the inherent freedom and sovereignty of the individual, which is the cornerstone of the document which lays out the moral and ideological framework on which our country established its independence and dedicated its existence, the Declaration of Independence. (i) The Declaration of Independence – which proclaims our philosophy of sovereignty, rights, and government. We enjoy our God-given rights because our founding documents boldly assert that only We the People have the right to determine our government, since it is only by the voluntary and temporary delegation of our rights to government ourselves that government exists. We have the right to “alter or abolish” government when it becomes destructive of its ends (which is first and foremost to protect and preserve our rights to Life, Liberty, and Property and the right to defend those rights). Nowhere in any of our founding documents is government given a life of its own; it has no right or power to seek its own self-interests nor to preserve, insure, or protect its existence. Yet today, government’s interests are placed above those of the People. Government has made sure that it has the exclusive power to define its own powers. I ask everyone to please take the time to read the Declaration and the Constitution and acquaint yourselves or re-acquaint yourselves with the principles that protect your liberties and define the government that our Founders created for us for that purpose. Share with family and friends. Reflect upon the quotes below and look at the QUESTIONS that I’ve listed which follow them and test your knowledge !! “The purpose of a written constitution is to bind up the several branches of government by certain laws, which, when they transgress, their acts shall become nullities; to render unnecessary an appeal to the people, or in other words a rebellion, on every infraction of their rights, on the peril that their acquiescence shall be construed into an intention to surrender those rights.” — Thomas Jefferson, Notes on Virginia, 1782. DO YOU KNOW YOUR CONSTITUTION and YOUR GOVERNMENT ?? 1. What is the relationship between the Declaration of Independence and the Constitution? 2. What is the purpose of the Declaration of Independence? 3. The first paragraph of the Declaration of Independence explains the foundation of Individual Liberty. What is that foundation (2 laws)? 4. The second paragraph of the Declaration of Independence explains the relationship between We the People and government in the United States. What is that relationship? 5. What are the first 10 amendments called? Why were they added? 6. Where in the Constitution is the “Wall of Separation” mentioned? 7. Where in the Constitution does it require criminals be read the “Miranda” warning? 8. Where in the Constitution do we find that the Supreme Court has the power to issue binding decisions? 9. Where in the Constitution do we find the president having the power to send US troops to engage in acts of war without an official declaration of war? 11. 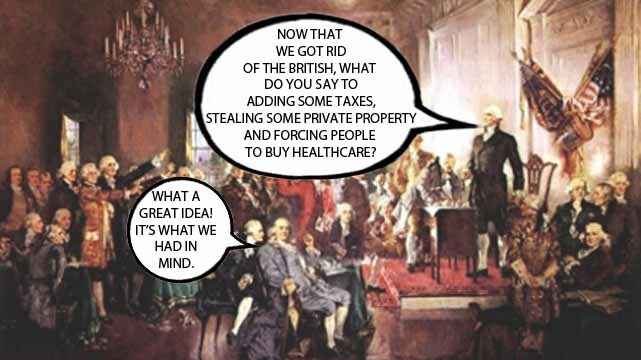 Where in the Constitution is the federal government granted the power to mandate healthcare or control education? 12. Where in the Constitution is Congress granted the power to spend taxpayer money to bailout selected businesses? 13. Where in the Constitution does it grant the Congress to tax and spend for any object other than those that are expressly listed in the Constitution? 14.What provision in the Constitution permits Congress to transfer its powers to legislate to unelected agencies? 15. Whose document is the Constitution? 16. Who does the Constitution protect? And what does it protect from? 17. Does the government have any “rights” under the Declaration of Independence or in the Constitution? Is there any provision that permits it to engage in action or policies to further its own interests and longevity? 18. The President believes he has the right to identify American citizens as “enemy combatants” (a term invented by the Supreme Court during the era of WWII) thereby detaining them indefinitely and denying them their constitutional rights. An “enemy combatant” is a person who engages in belligerent acts (war) against the US. Isn’t this type of person already identified in Article III, Section 3? 19. Can a treaty over-ride any provision of the US Constitution? Can it limit any of the Bill of Rights? 20. Which provision in the Constitution is the state equivalent of the Supremacy Clause? 21. Which Article establishes the automatic nullification of unconstitutional laws? 22. What Article requires that all government officers, both state and federal, must have a working knowledge of the Constitution? 23. At whose level of understanding was the Constitution drafted? 24. Who or what does government serve? 25. When elected representatives and government officials (both federal and state) take their oath of office, what do they pledge their allegiance to?? The United States or the US Constitution? 26. In Article V, Section 2 (Supremacy Clause), it reads: “in pursuance thereof.” What does that mean? 27. What are the citizenship requirements for a candidate seeking to be President of the United States? 1. The Declaration is our moral compass. It establishes the relationship between the Individual and government. 2. The Declaration of Independence had 2 purposes. First, it declared that the American states were dissolving the political bonds that connected them to Great Britain. In other words, the Declaration was a secessionist document. Second, in explaining the reasons for their dissolution, the states proclaimed “to a candid world” the fundamental principles upon which they would declare their independence as free and sovereign states. The Declaration articulated the foundation of their societies and their government. It articulated the American blueprint for ordered liberty. The American system would be founded on the supreme sovereignty of the Individual (“We hold these truths to be self-evident, that all men are created equal, that they are endowed by their Creator with certain unalienable Rights, that among these are Life, Liberty and the pursuit of Happiness.–That to secure these rights, Governments are instituted among Men, deriving their just powers from the consent of the governed”). In announced that there would be no divine right of Kings or any premise that rights come from government. In fact, it would be the other way around. Government would only have those powers that the people voluntarily transfer or delegate to it to make laws for and protect them. That’s why all 13 states at the time agreed to the provision that “whenever any Form of Government becomes destructive of these ends (to protect and secure the rights of the People), it is the Right of the People to alter or to abolish it, and to institute new Government, laying its foundation on such principles and organizing its powers in such form, as to them shall seem most likely to effect their Safety and Happiness.”). 5. The Bill of Rights. The first 10 amendments grant NO rights. They acknowledge certain rights that are so fundamental, so essential, and so integral to the notions of liberty that the FEDERAL GOVERNMENT is absolutely prohibited from violating them. 6. This is a legal fiction – devised by a progressive Supreme Court designed to centralize power in the federal government. The Justice who gave us the “Wall of Separation” was Hugo Black, in the 1947 case Everson v. Board of Education. Hugo Black was a leader with the KKK, tasked with administering the Klan oath (one provision being that there is a “Wall of Separation” to prevent Catholics, one of their target groups, from gaining any political power). In the decision, Black wrote: “The First Amendment has erected a wall between church and state. That wall must be kept high and impregnable. We could not approve the slightest breach.” Our Founders understood that the key to effective, responsible government is having a citizenry that is capable of governing themselves and conducting themselves according to certain productive guidelines. Those guidelines come from morality and religion (which are intertwined). Only a moral and religious people are capable of ensuring that government remains limited and therefore capable of preserving liberty for future generations. 7. Another legal fiction – again devised by a progressive Supreme Court (the Earl Warren Court in 1966, in the case Miranda v. Arizona). The Warren Court was characterized as promoting the rights of criminals over victims and the ability of police (and the criminal justice system, in general) to fight crime and protect law-abiding citizens. The Miranda warning is not a constitutional right… it is a procedural safeguard imposed by the Supreme Court to make sure criminals do not suffer any violations of their constitutional rights with respect law enforcement. The Miranda warning includes elements of the Fifth Amendment (protection against self-incrimination) and the Sixth Amendment (the right to counsel). After Warren’s time as Chief Justice ended in the mid 1970’s, a more conservative Court appointed by President Richard Nixon set out to undermine the Miranda ruling. For the next twenty years, the Court weakened Miranda by un-mooring it (unlinking it) to the Constitution. The subsequent (conservative Courts), the Burger and Rehnquist Courts, later interpreted the Miranda holding as a mere prophylactic [protective] measure and made clear that a violation of Miranda does not equal a constitutional violation.” (1994). While it was still illegal for prosecutors to use a transcript of a defendant’s coerced testimony against him or her at trial, the information gained from that testimony could still be used to build a case against an accused. The Supreme Court had the chance to re-visit Miranda warnings in 2000 (in Dickerson v. US) and overrule the Miranda decision, but it chose not to. It chose to save Miranda. In Dickerson, Chief Justice William Rehnquist explained that the Court would not address the issue of whether Miranda warnings constitute judicial overreaching (He wrote: “The Court may or may not agree”), but would stand on stare decisis (the judicial practice of relying on Supreme Court precedent, or prior decisions). In other words, the Court would not feel it was necessary to reverse the Miranda decision of 1966. Rehnquist made two points to support the decision: (1) “We do not think there is such justification for overruling Miranda. Miranda has become embedded in routine police practice to the point where the warnings have become part of our national culture,” (ie, NYPD Blue, Law & Order, etc); and (2) The Supreme Court has already weakened Miranda sufficiently so that it no longer effectively prevents slaw enforcement from good police work. 8. Read Article III. It reads: “The judicial power of the United States….” [“United States” means federal government. When the Constitution was ratified, the nation was considered a Union of sovereign states. It’s name was NOT the “United States.” If anything, the nation was referred to as “The united States,” meaning that the individual states have formerly decided to unite for limited and common purposes, for their ultimate protection and security]. So, the judicial power of the government was vested in one supreme court and other inferior courts (as the Congress might from time to time ordain and establish. In Section 2, the Constitution assigns jurisdiction to the Supreme Court. In certain cases, the Court has “original” jurisdiction (meaning that the first time a case is heard, it goes before the Supreme Court), but nowhere does the Constitution state that jurisdiction is also “exclusive.” So cases can be heard in State courts as well. Nowhere does the Constitution state that decisions by the Supreme Court trump decisions in a state’s highest court. 9. Nowhere. The power to declare war is set out in Article I, Section 8. In Article II (The Executive), it states clearly that the President only becomes the Commander-in-chief of the Army and Navy (and of the state militias) when they are called into service of the United States (again we see the term “United States.” Again it means the federal government). So the President becomes the Commander-in-chief of the Army and Navy when they are called into service by the federal government. In other words, only after Congress declares war are the forces of the United States called into action and only then does the President assume war powers. nearly all National Guard Forces in various states; Georgia, Alabama, Kansas, Minnesota, Tennessee, Virginia, Louisiana, South Carolina – to name a few. In response, the Governors of Alabama, Georgia, Louisiana, South Carolina, Tennessee, Texas, and Virginia have re-established “State Defense Forces.” (These forces can go against federal forces should the need arise. Also important to note: There are NO federal laws prohibiting National Guard troops from also joining their State’s Defense Forces. This dilemma occurred during the Civil War with many “citizen soldiers” choosing to serve their states instead of the Federal Government). 10. The Executive and Legislative branches have no such power. In fact, both branches are EXPRESSLY forbidden from limiting any of the rights acknowledged in the Bill of Rights. Likewise, they are forbidden, by the Ninth and Tenth Amendments, from limiting the scope of rights reserved to the People and the States, respectfully, when the Bill of Rights were adopted (1789). On the contrary, the Bill of Rights expressly limits the power of the federal government. The Bill of Rights does not grant us any rights. Rather it re-affirms certain rights so fundamental, so essential, and so integral to our humanity and assures, through a permanent addition to the US Constitution, that the federal government cannot violate, infringe, or even burden such rights. The government is a limited social compact. The Constitution, when ratified by 2/3 of the states back in 1787-1789, “created” or established the federal government. By its very terms and provisions, the government created was intended to be a limited common government for the purpose of “managing” and serving the States – not to control them. The Constitution creates a government separated into 3 distinct spheres of power (Separation of Powers), it creates a series of Checks and Balances, it checks power through the federal nature of government (States v. Federal Government, each possessing sovereign power; memorialized by the Tenth Amendment), and it further limits power by incorporation of the Bill of Rights. If anyone can look at all these safeguards and not understand that our government was intended to be one of limited powers and limited scope, then they need more formal education. 13. Nowhere. Congress is given express authority to legislate for approximately 17 enumerated objects (Article II, Section 8). 15. It is the People’s document. It is a permanent and binding charter (social compact or social contract) which transfers limited sovereign power from a free people to a government for the purpose of that government to serve them and to protect their God-given inalienable rights (after all, “inalienable” means non-transferable. Fundamental human rights can never be divested or deprived from human beings… that is, under the American system of government, thanks to the Declaration of Independence and the Bill of Rights). The Constitution limits government in our lives – at least it was supposed to. It sets boundaries on government, thereby allowing us to freely exercise our natural, God-given, inalienable rights. It is a RESTRAINING ORDER on government. 16. The Constitution protects We the People from unsanctioned interference in our lives and upon our liberties and property by government. It limits government in our lives. See answer above. 18. Such a person would be a traitor. Another title was invented by the Supreme Court (in an attempt to give FDR the extra power he wanted for the federal government; See Ex Parte Quirin, 1942) solely for the purposes of giving the President of the United States extraordinary power to strip American citizens of their constitutional rights in order to interrogate them and punish them. Article III, Section 3 defines treason and defines a traitor: “Treason against the United States shall consist only in levying War against them, or in adhering to their enemies, giving them aid and comfort. [ie, Waging war against the United States or aiding and abetting an enemy]. 19. NO !!!! Treaties are equivalent in stature to federal law. They have the same force of law and status as federal laws. 21. Article VI, Clause 2 (the “Supremacy Clause”). If a federal bill is not passed in “pursuance” to the Constitution, it has no constitutional or legal authority and cannot be regarded as “supreme law of the land.” If it is supreme, then the authority to regulate falls to the States. In fact, it is the duty of the States, under our notions of ordered liberty and under the Tenth Amendment, to prevent unconstitutional laws to be enforced upon a free people. 23. The “average citizen” or “voters.” See the very recent cases of District of Columbia v. Heller (2008) and McDonald v City of Chicago (2010) – both addressing the Second Amendment right to have and bear arms. 24. Government serves We the People.” It has no more authority to govern us, our lives, or our property than what is delegated expressly in the Constitution. Same thing for state governments and state constitutions. Constitutions represent the “Permanent Will of the People” in establishing the role, the scope, and the limits of government in their lives. 26. It means two things. First, a federal law, for example, must comply with the procedural requirements of the Constitution such as being passed by both Houses of Congress before being signed by the President and appropriations bills must start in the House. Second, it must substantively comply with the Constitution i.e., be within the enumerated powers of the general government as spelled out in the Constitution. (2) to increase the likelihood that the interests of any President of the United States will coincide with those of the United States. What does “natural born citizen” mean? –> So, the following interpretation of the phrase “natural born citizen of the United States” most likely means: Those citizens born as citizens (of the United States) of the particular expectable kind that is considered by the United States as belonging to the United States to a maximal degree. (iii) The person has been a Citizen of the United States, since birth. NULLIFICATION IS THE MOST EFFECTIVE WAY TO RESTORE CONSTITUTIONAL LIMITS !! Thomas Jefferson called Nullification the “Rightful Remedy” to stop the federal government from enforcing unconstitutional laws, policies, and court decisions on the American people. Learn more about Nullification. Join us at NULLIFY NOW! in Raleigh on Saturday, October 19 at 9:00 am the Raleigh Convention Center, 500 S. Salisbury Street, downtown Raleigh. SPEAKERS include Thomas Woods (author of “Nullification: How to Fight Federal Tyranny in the 21st Century”), Mike Church (conservative talk radio show host and producer), Publius Huldah (dynamo strict constitutionalist and lawyer), Michael Boldin, Dr. Greg Brannon (running for US Senate), Dr. Dan Eichenbaum (of Dr. Dan’s Freedom Forum), and others! Get your tickets now for $10.00 – at www.nullifynow.com. This entry was posted in Uncategorized and tagged Bill of Rights, Constitution, Constitution Day, Declartion of Independence, government, nullification, Nullify Now, Raleigh, Thomas Jefferson, unconstitutional. Bookmark the permalink. Again, you have done a great job in presenting a very difficult subject. However, I would suggest a different perspective on one of your comments. Number 1 under Answers starts: “The Declaration is our moral compass.” If one would just look at the preamble of the Declaration of Independence which includes the phrase: We hold these truths to be self-evident: one would have to agree with you. The second part of the Declaration contains indictments against King George III. The 20th indictment starts with: “For abolishing the free system of English laws in a neighboring province,…” (http://avalon.law.yale.edu/18th_century/declare.asp) This refers to a barrage of disappointments that begins in 1770. In 1763 Benjamin Franklin and other Colonist had been given thousands of acres in the Ohio River Valley as a reward for their support in the French and Indian Wars. In 1770, Benjamin Franklin and others asked London if the colonist could set up a government in Ohio. In 1772 the answer came back in “Report of the Lords Commissioners for Trade and Plantations…” (http://archive.org/details/ reportoflordscom00grea). Foremost among the reasons was that the Indians (including the Cherokee) held sway in the region. Adding insult to injury, King George issued the Quebec Act of 1774 (http://avalon.law.yale.edu/18th_century/quebec_act_1774.asp). This reaffirmed that the Ohio River Valley belonged to Canada. Franklin and friends could farm in the Ohio but the could not govern Ohio. We are lucky! The Omohundro Institute of Early American History & Culture is having a conference about the Québec Act of 1774: Transnational Contexts, Meanings, and Legacies, in Montréal, Québec in early October (http://oieahc.wm.edu/conferences/).